I really wanted to add a quilled element to my card. With this card, I cut about an inch off the end of the card. I added a piece of printed victorian paper and put a strip of cream loop edged satin ribbon at the bottom. 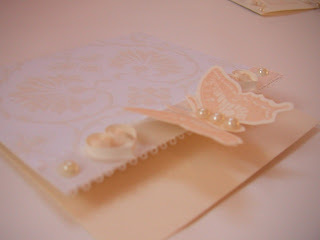 I stamped the butterfly on a piece of card and cut it out. I glued the butterfly to the front of the card at the bottom, so the base of the butterfly was level with the back to the card (so it would stand up properly). 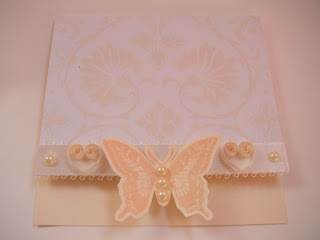 I added some flat backed pearls to the ribbon and to the body of the butterfly. 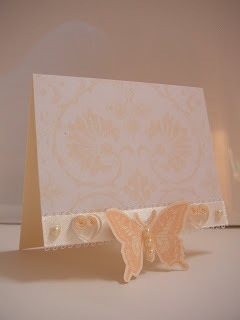 Using a strip of cream paper I made the two quilled hearts and glued them carefully to the card. Would make a nice wedding invitation I thought.